Russia-backed militants have significantly decreased the number of attacks in eastern Ukraine. However, despite the recent decision on establishing a holiday ceasefire, the militants delivered nine precision attacks against Ukrainian troops yesterday. 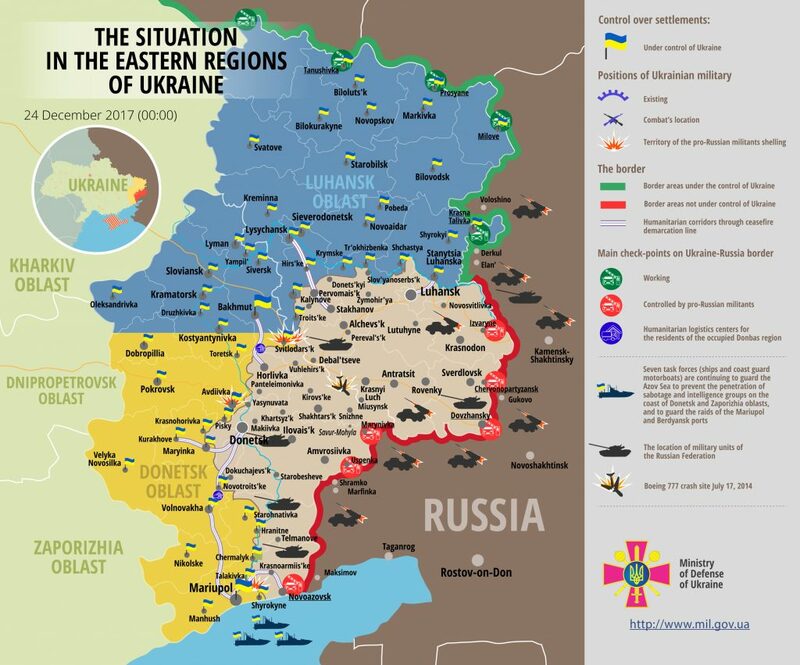 Ukrainian troops did not return fire, reported Colonel Oleksandr Motuzyanyk, Ukrainian Ministry of Defense spokesman on ATO, at a press briefing at Ukraine Crisis Media Center. In Luhansk sector, Russian proxies violated the ceasefire seven times. At 10:45 the militants attacked Ukrainian positions in Svitlodarsk area with small arms, light weapons, and IFVs. The attack continued for two hours. Later in the evening they also fired three 82-mm mortar rounds there. At 11:30 Russia-backed militants started a five-hour attack against Ukrainian positions in Luhanske area. “Russian proxies fired four 82-mm mortar rounds there, employed IFVs, antiaircraft mounts, and small arms, including sniper weapons,” Colonel Motuzyanyk elaborated. The militants delivered three more attacks against Ukrainian positions there during the day, though not using mortars. In Donetsk sector, Russian proxies delivered two attacks on Ukrainian positions: they used large caliber machine guns in Avdiivka area, and small arms in Lebedynske area. Unfortunately, one Ukrainian serviceman was killed in action by sniper, and one more was wounded by mortar fire in Luhanske area yesterday. Report on the military developments as of December 23 is available here. Interactive data on the shelling: chronology shelling chart and the interactive map.